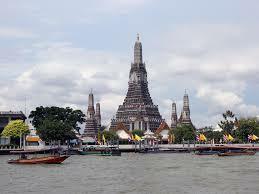 Famous Wat Arun Temple in Bangkok, capital of Thailand. 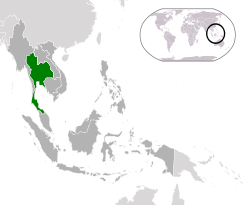 Thailand alone in Southeast Asia, was able to maintain its independence during the era of European imperialism. The country maintained a monarchy as a head of state throughout the turbulent 20th century. Yet since the political reforms of 1932, which limited the power of the king, there have been 19 different constitutions and charters. The present king came to the throne in 1946 and has survived, despite the momentous change the country has undergone. The nation of Thailand would be dominated by military dictatorships from 1932 to 1973. Then followed an unstable period of democracy, which ended in a bloody coup in 1976. It was at this time, the military would reassert control. For most of the 1980’s the country would be ruled by Prime Minister Prem Tinsulanonda. Although he was somewhat authoritarian, he did restore parliamentary government. Democracy would survive for most of the latter part of the century, except for a brief period of military rule in 1991 and 1992. Both the King and Prem had been in favor of constitutional rule. 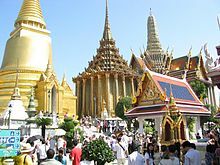 Wat Phra Kaeo in the Grand Palace is among Bangkok’s major tourist attractions. Prime Minister Thaksin Shinawatra from the Thai Rak Thai party, governed from 2001 to 2006. Mass protests for alleged corruption caused the military to stage a coup, in September of that year. A general election in December of 2007, restored civilian control. The army would seize power once again in May of 2014 and has maintained power since then. This time the army seems to be settling in, following the overthrow of the elected government of Yingluck Shinawatra. The military installed Prime Minister Prayuth Chanocha, has censored the press and forbidden most forms of political expression. Critics of the government and even the upcoming referendum, have been detained and harassed. In the case of the king, criticism of the monarch can bring a harsh prison sentence. The military junta has stepped up prosecutions and convictions of this crime. The political elite that have received enormous benefits from royal patronage are in opposition to the the masses, who favor reform and more democracy. 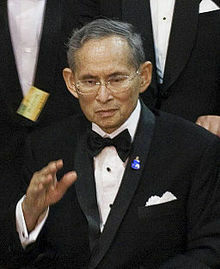 King Bhumibol Adulyadej is the world’s longest reigning monarch. He has presided over Thailand for a total of 70 years and is widely popular. Most of the citizenry do not remember a time,when he has not been their regent. At 88, his health is fragile and he has not been seen in months. In June and July of this year, doctors have drained fluid from his brain. He has been hospitalized for weeks at a time this year. The king and his advisers have played an active, but subdued role in the politics of Thailand for decades. In time of crisis, the king has sometimes acted as a final arbiter. However, it does seem that there has been an endorsement of a number of military takeovers over the years. Yet, it must be said that it often resulted in ending the violence that had erupted on the streets. In May of 1992 for example, King Bhumibol called for an end to the political battles that had became bloody in an ongoing struggle. The strife between the army installed government and pro-democracy demonstrators soon ended. The prime minister was forced to resign and civilian control returned. The death of the king could further weaken the bonds that are barely keeping the present outward peace in Thailand. His passing could well lead to further strife and economic dislocation. 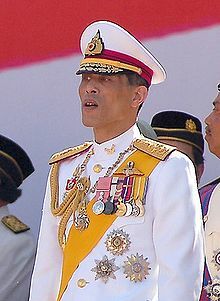 There is no replacement for the king, as his son and successor Maha Vajiralongkorn is hugely unpopular. Despite the on-going turbulent political developments,Thailand still grew to become the 2nd largest economy in Southeast Asia. Growth had averaged 3 to 4% annually from 1994. Most of this was due to the expansion of agriculture,light and heavy industry. Nevertheless, the country has fallen into a middle income trap. This has exasperated economic inequality throughout the country and widened the imbalance in economic development. The economy of Thailand grew by 2.8% last year and is expected to expand by 2.5% this year. When one considers the slowing global economy and the impact this has on the export market, the rate of growth seems adequate. However in comparison to the rest of the East Asia, it is mediocre at best. The region at large, is projected to grow by 6.3%. Growth within the kingdom has become far too dependent on tourism and increasingly more fiscal stimulus. Thailand has a number of obstinate barriers that will impede future growth. The inefficiency of government bureaucracy towards infrastructure investment, remains a major challenge. This has a direct effect on the competitiveness of Thais exports. Exports from Thailand have declined year on year for 10 of the last 13 quarters, already beginning in 2013. Services alone are the one constant positive aspect in the trade situation, as tourists continue to arrive. Spending on consumer goods is slowing as well. The lower demand for imports, has permitted the country to post a surplus in its international payments. The high level of debt among farmers as a result of a two year drought and weak overall global commodity demand, is having a strong detrimental effect on the domestic economy at large. Household debt in Thailand overall, now exceeds 80% of national output and is still climbing. Another issue facing Thailand is the woefully inadequate education and jobs training. The skills of the populace often do not match the needs of modern business and industry. It is the major impediment to raising the competitiveness of the country’s economy. The result has been a falling share of foreign direct investment coming to Thailand over the last decade, in relation to other countries in Southeast Asia. 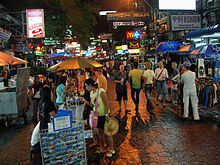 Khao San Road in Bangkok is lined by budget accommodation, shops and bars catering to tourists. A longer term concern is the rapidly aging population, which will begin to have a negative impact after 2020. The projected decline in the workforce is higher in Thailand, than in any other country in East Asia. The part of the population of working age, is projected to drop as much as 11% by 2040. This would shrink the proportion from 49 to 40.5 million. Increasing labor productivity will therefore become, one of the most pressing needs facing future policymakers. In addition to far fewer workers, the country will soon be saddled with rapidly rising healthcare and associated retirement costs. Thailand is growing older, before it becomes far richer. This is an ongoing issue that will not be solved in the short term. The new engines of growth for Thailand will have to be biotechnology, health, smart devices and robotics. More efficient practices in agriculture and food production will also be part of the mix. Bangkok’s Democracy Monument: a representation of the 1932 Constitution sits on top of two golden offering bowls above a turret. The problem is private investment a major driver of economic growth, continues to stagnate. It grew just a mere 1.5% in 2015 and is forecast to contract by 2% this year. New applications for investment have fallen near 90% since 2014. It is the current political uncertainty around the progress of constitutional reform and when a general election will actually take place, that is partly forestalling faster growth. This is evidenced through lower business sentiment and consumer confidence, since the commencement of military control in May of 2014. The 3% rate of increase in the GDP forecast for 2017, remains dependent on political stability. The electorate is preparing to vote in a referendum on August 07th,on a new constitution. The new draft is asking for citizens to approve the creation a government, that will permit the military to have a far more active political role. The new format will include a 250 member military appointed Senate, along with an elected 500 seat lower chamber. United Front for Democracy Against Dictatorship, Red Shirts, protest on Bangkok Ratchaprasong intersection in 2010. There is real doubt in the amount of public support for the reforms, as civic groups oppose the plan outright. The new Prime Minister for example, will come from a joint sitting of both houses giving an enormous advantage to the military preferred candidate. It is unknown what will happen if the referendum fails to pass. What is likely will be a further postponement, to tentatively scheduled elections next year. The government could also well decide to create a constitution of their own choosing, similar to what is presently being offered to voters. The military is still failing to address the growing political divisions within Thailand. New elections will not necessarily solve this problem. In fact, it may possibly lead to even further unrest. As it is, time is running out to install a new system of government, while the king still lives. As by far the most popular figure inside the country, his acquiescence is vital in forging a comprise between the various factions. Previous Post → United States 2016 Presidential Election: Plans For Economic Growth?